Known for its friendly people, rugged landscapes and world famous seasonal veld flowers, South Africa’s West Coast wine route is cooled by the Atlantic Ocean and centred on the mighty Olifants River, which is the vein of life for surrounding agricultural activities. The wine industry is the most important source of employment in this region and plays a vital role in uplifting communities by creating job opportunities for unskilled labourers. The fertile soils and irrigation from the river allow for higher yields of quality grapes and the region has gained a reputation for producing wines that over-deliver at modest prices. Colombar and Chenin Blanc are the most popular grape varieties and produce refreshing, crisp and fruity wines, which are often enjoyed with the delicious lobster and snoek – a sought-after indigenous game fish – that abound in the neighbouring Atlantic. 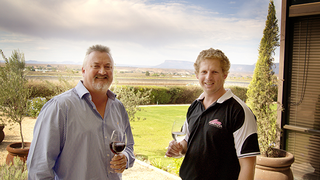 Namaqua wines is the largest and most acclaimed winery in this region, and the second-largest cellar in South Africa. Best known for its cheerful bag-in-box wines, versatile Namaqua also boasts the most acclaimed Pinotage vineyard in South Africa. So it comes as no surprise that domestic demand for Namaqua’s wines has steadily increased. To add to this, Namaqua’s production manager, Len Knoetze, explains that with smaller wine harvests across Europe, the prices for entry-level white and red wine in the global bulk wine market had increased phenomenally, which has made this a lucrative sales channel to pursue. Meanwhile at Namaqua, new vineyard plantings and improved farming practices have also led to bigger grape harvests, requiring expansion of the production facility to be able to reduce the pressure on the cellar. Namaqua’s production operations comprise two facilities: Spruitdrift Cellar, where the production of most of the red wines, including the lauded Pinotage, takes place, as well as Vredendal, predominantly a white wine cellar. Because of this cellar’s location, expansion is particularly difficult and expensive. An increase in white grapes intake, however, meant that truckloads of Chenin Blanc and Colombar often had to queue outside the Vredendal facilities before they could be delivered to the cellar. This was not only a frustration to grape producers, but it also had a negative impact on the quality of the grapes and eventually the wines. “We had to make a decision based on projected growth expectations and the most practical solution was to shift at least 10,000 tonnes of Vredendal cellar’s white wine production to Spruitdrift. This had to be done in the most cost-effective manner, that did not require a lot of space – without compromising quality,” explains Knoetze. The first decision to be made was whether to expand by replicating existing processing systems, which comprise pneumatic wine presses and settling tanks. The lucrative alternative was a continuous centrifugal decanter system, which potentially had revolutionary capabilities, but also involved risk, since no one at Namaqua had experience of this new technology. This was considered a long-term project, requiring planning and research. “We have a saying that getting married is more complex than buying bread. The expansion process reminds me of that and was almost as crucial as choosing the right wife,” jokes Knoetze in typical West Coast fashion. The first step in choosing “Namaqua’s wife” was a trip to Spain, France, Italy and Germany with Alfa Laval business unit manager Ulrik Brasen, during which Len and winemaker Reinier van Greunen had the opportunity to see how Foodec decanter technology was applied in other winemaking regions. This technology has been utilized by a plethora of food categories, from vegetable oil to beer, but also in the mining and pharmaceutical industries, with recent fine-tuning making it suitable for wine processing. 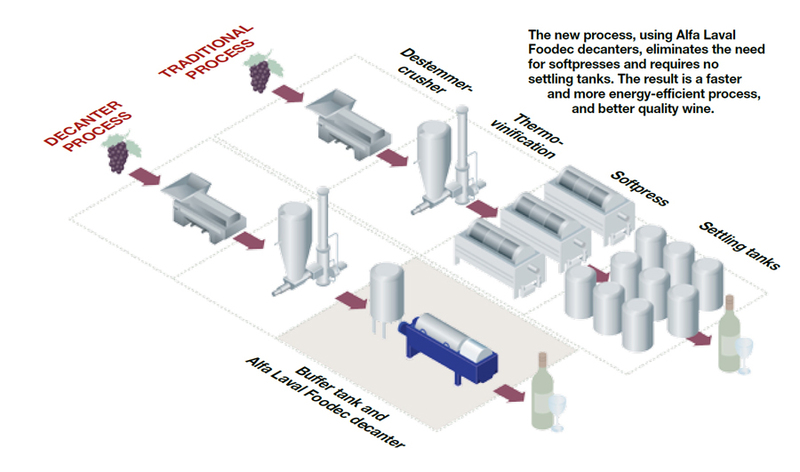 The process effectively replaces conventional pressing and settling with one continuous process. The decanter separates solids from liquid phases in a single continuous process, using centrifugal forces. When subjected to such forces, the denser solid particles shift outwards against the rotating bowl wall and the liquid phase forms a concentric inner layer. In winemaking terms, the solid particles would be grape skins and pips, while the liquid component that is extracted would be grape juice that would then be fermented in steel tanks. Namaqua did a trial with a decanter in 2011 and was convinced that this new technology could be the best-suited solution to its expansion efforts. The trial was more than enough to convince the Namaqua team that decanters are the progressive way forward. In fact, it led to the installation of the world’s most expansive wine centrifugal decanter system, comprising four large decanters, in that same year. The Namaqua winemaking team have not looked back since then and have improved the winery’s efficiency by saving time and substituting outdated methods and equipment. Substituting static pneumatic pressing, and particularly juice settling, with one continuous process reduced the processing time from when the grapes enter the cellar door to when the juice is settled in tanks by as much as 24 hours. Similarly, because one continuous process replaces three different conventional steps – free flow separation, pressing and settling – the new system was far less labour-intensive and also required less space. To add to this, the decanter system is more energy- efficient, because the excessive cooling required for conventional settling processes is cut out of the system. The installation of an integrated decanter system has also led to an unexpected improvement in wine quality. A total of 35,000 tonnes of winegrapes were processed using Namaqua’s new decanter technology during the 2012 and 2013 vintage. Chemical analyses and sensory grading through controlled blind tastings revealed that despite the higher juice recovery, grapes that were processed at the new facilities more often than not yielded better-quality wines than those that had undergone conventional methods. This included red, white and rosé wines from different cultivars. Knoetze and Van Greunen are convinced that the Alfa Laval centrifugal decanting technology has fundamentally changed winemaking at Namaqua and suggested that this would certainly be incorporated in future expansion at the cellars. The tasting panel commented that the 2013 vintage of Namaqua popular white table wines are well balanced, with more expressive fruit character – ideal for Atlantic crayfish and snoek and likely to further increase the demand for these bag-in-box beauties. We have a saying that getting married is more complex than buying bread. The expansion process reminds me of that and was almost as crucial as choosing the right wife.